Soapstone is a truly unique product commonly used for kitchen countertops, bathroom vanities, sinks, floor tiles, fireplace surrounds and fire bricks. It provides a timeless aesthetic appeal as well as a durable and attractive element to today’s home renovation projects. People select Soapstone for its distinctive look and feel. It is warm, soft and silky to the touch and is installed to a matte finish. Soapstone doesn’t require any maintenance to protect it from staining. Its known for its durability, heat and stain resistancy and has been used in science classrooms and chemistry laboratories for many decades. This makes Soapstone the perfect application for kitchen countertops, especially when you consider that a home kitchen is very much like a science lab. One little-known fact about soapstone is that it conducts heat. It’s a great place to thaw out meat, poultry and fish. Conversely, it also retains cold, so if you wanted to make your countertop cold for any reason, you can simply place a bag of ice on the stone for a period of time and then use the cold surface for your intended purpose. Such uses might include rolling out a pie crust or making homemade ice cream. One of the most frequently asked questions is price. Depending on the size, a Soapstone countertop could run approximately $65 – $85 per square foot (installed). Other options include do-it-yourself and fabricated-to-spec slabs. 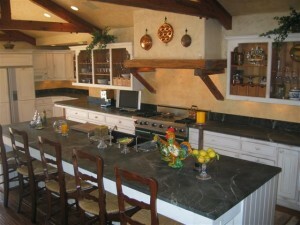 Note that it’s absolutely crucial to have someone who is specialized in the fabrication and installation of Soapstone. Philadelphia Soapstone is comprised of specialized, knowledgeable, highly trained professionals who undersand the major differences between soapstone, granite and marble. Be wary of other countertop companies who say, “Sure, we can install soapstone.” This is often not the case. Soapstone is a totally different stone, requiring different tooling. At Philadelphia Soapstone, we are committed to providing you with superior service at every step in your home renovation process. From slab selection to template design, fabrication to installation, our seasoned experts will guide you in making a well thought-out, confident Soapstone purchase that will delight you and your entire family for generations. Obtain your FREE QUOTE today. Contact joemack@phillysoapstone.com to request a 4” x 4” Soapstone sample in the mail or to schedule a visit to our showroom and factory in Blackwood, NJ. Call (856) 232-7627 with any questions or to receive additional information.